The Sculpture department welcomes visiting artist Tomashi Jackson. Born in Houston and raised in Los Angeles, Jackson currently lives and works in NYC. She holds an MFA in Painting and Printmaking from the Yale School of Art and earned a Science Master of Art, Culture and Technology degree from MIT in 2012. 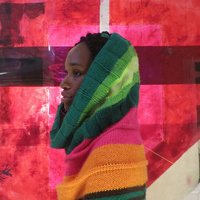 Her work has been exhibited in Cambridge, MA; East Lansing, MI; San Francisco, CA; Miami, FL; Minneapolis, MN; and New York City. She has performed at MoMA PS1, Parsons the New School of Design, The Harvard Signet Society, and the Cooper Union for the Advancement of Science and Art.